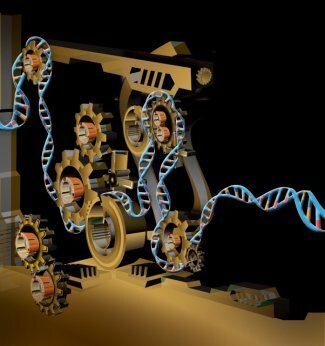 Ten years after the human genome was first published, researchers have found new clues into the machinery that influences gene function. The team, led by Bradley Bernstein, an associate professor of pathology at Massachusetts General Hospital and Harvard Medical School and senior associate member at the Broad Institute, and Aviv Regev, a core member at the Broad Institute and associate professor at MIT, focused on chromatin, the complex of non-genetic material associated with DNA that drives gene expression, and specific regulators that orchestrate chromatin activity. “We know that many different chromatin regulators direct chromatin’s structure and activity,” explains Charles Epstein, Epigenomics Program manager at the Broad Institute. But the specifics of how these regulators operate have been unclear. In a paper published in the early online edition of Cell, the team reports that specific combinations of chromatin regulator proteins control essential chromatin activities, like histone modification. Histone proteins are part of the non-genetic material that composes chromatin. By modifying these proteins the chromatin influences how the underlying DNA genetic code is interpreted or expressed. Going forward, the team hopes to predict histone modification patterns according to the type of chromatin regulator activity. By applying RNAi techniques, they will study the effects of removing one of the components of a chromatin-regulator module. “This will allow us to functionally understand what happens when one interferes with specific chromatin regulators,” adds Epstein. Broad researchers contributing to this work include Ido Amit, Noam Shoresh, Nir Yosef, Manolis Kellis, Melissa Gymrek, Robbyn Issner, Michael Coyne, Timothy Durham, Xiaolan Zhang, Julie Donaghey, Charles B Epstein, Aviv Regev, and Bradley E Bernstein.